Little has changed since this ABC report in 2014 by Liz Fields. Despite years of intense hunting and trapping, Texas is losing the war on feral hogs. Since the Texas Parks and Wildlife Department (TPWD) first began removing feral hogs in 1982, the hog population in the Lone Star State has dramatically increased and there are now more than ten times as many hogs in the state as there were then. Unfortunately, the evidence is clear: Texas is losing the war on feral hogs. Texas has very permissive regulations regarding hog hunting and hunters may pursue hogs all year long with no bag limit. They may be hunted over bait, trapped, hunted at night and from aircraft. As a result, it is estimated that over three quarters of a million hogs are taken by hunters, trappers, and TPWD each year in Texas. Unfortunately, it is not enough. Even though hunters and trappers are killing approximately 30 percent of the hog population in Texas annually, hog numbers are still growing by about 20 percent each year. Biologists estimate that 70 percent of the hogs in the state will have to be killed each year just to maintain the population and even more must be killed to actually start reducing their numbers. Yes, you read that right: 7 out of every 10 hogs in the state must be killed just to keep their numbers where they are now. So why are hog populations experiencing such explosive growth? The main reason is that hogs breed almost as quickly as rabbits. They become sexually mature before they are a year old and can produce as many as three litters of 6-8 piglets every year. Another reason they are difficult to control is because feral hogs are very intelligent and resilient animals. They quickly respond to hunting and trapping pressure by changing their habits or just leaving the area for greener pastures when things get too hot. 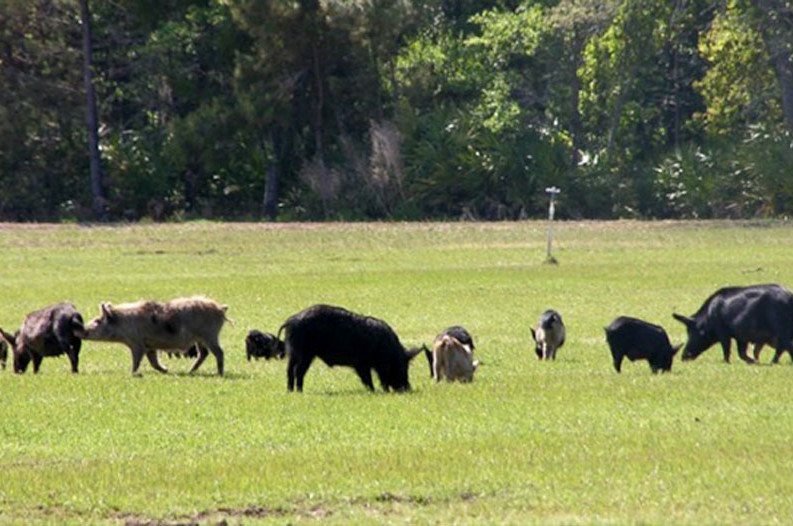 Since they are known to roam over extremely long distances in search of food, this makes long term hog control measures difficult and complicated. Landowners and biologists have been relatively successful in controlling feral hog populations in small areas. However, these are usually short-term successes that only last until a new hog sounder moves in and the cycle starts over again. While hogs are fun to hunt and provide some very tasty table fare, they cause all sorts of problems. Their diet normally consists of things like roots, acorns, tubers, and other plants, they will eat literally anything they can find or catch. Crops, snakes, insects, ground-nesting birds, and even deer fawns are not safe from a hungry hog. Hogs are a textbook example of an invasive species and are causing significant damage to native Texas wildlife and ecosystems. In addition to competing directly with deer for food, they damage vegetation that quail and turkey need to thrive. They also are carriers of a number of nasty diseases and there have even been cases of drinking water sources being contaminated by droppings from feral hogs. So, we’ve established that Texas is losing the war on feral hogs and that’s clearly a bad thing. However, what can be done about it? Hog hunting and trapping are already going full bore in Texas. Right now, these operations are taking less than half the number of hogs necessary to stop their explosive population growth and it is doubtful this can be achieved by hunting and trapping alone. Poison is one potential way to turn things around in the war on feral hogs. Australia has successfully used sodium nitrate to control hog numbers with great success and biologists have been trying it out at the Kerr Wildlife area in Texas for the last couple of years. One of the big concerns with using sodium nitrate or any other poison to control hog numbers is finding a poison that doesn’t harm other animals. The last thing we want is to kill a bunch of hogs with poison then start having all the vultures and other scavengers die from eating poisoned hog carcasses. Fortunately, preliminary research indicates that scavengers are not at great risk by eating dead hogs poisoned by sodium nitrate. Is this the solution that will end the war on feral hogs? I’m not sure, but it sure seems like a good idea at first glance. Until a permanent and lasting solution is developed, we’ll have to deal with hogs the old fashioned way: by hunting and trapping them. So, hit the woods and start doing your part in the war on feral hogs. We are also losing the war on hunger. I don’t understand why they cannot formulate a trapping program that would pay bounties on trapping feral hogs and turning them into specific “state sanctioned” food packers, who could process them and send them to area food banks or such. It sure took the buffalo population to near extinction, albeit they didn’t use the meat.